I’m a cancer patient since June 2014, and I started with cannabis oil with good results. However, over time the colon cancer mutated and made progress. Although cannabis did not allow the cancer to metastasize outside the colon, the main tumor has grown back to about 4x5x6 cm. That is when I found Spooky2 thankfully! 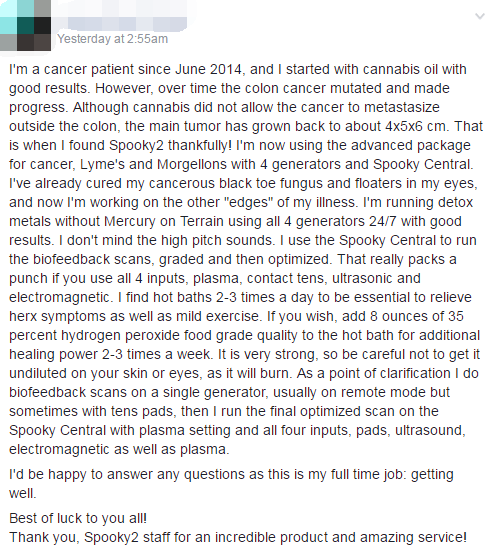 I’m now using the advanced package for cancer, Lyme’s and Morgellons with 4 generators and Spooky Central. I’ve already cured my cancerous black toe fungus and floaters in my eyes, and now I’m working on the other “edges” of my illness. I’m running detox metals without Mercury on Terrain using all 4 generators 24/7 with good results. I don’t mind the high pitch sounds. I use the Spooky Central to run the biofeedback scans, graded and then optimized. That really packs a punch if you use all 4 inputs, plasma, contact tens, ultrasonic and electromagnetic. I find hot baths 2-3 times a day to be essential to relieve herx symptoms as well as mild exercise. If you wish, add 8 ounces of 35 percent hydrogen peroxide food grade quality to the hot bath for additional healing power 2-3 times a week. It is very strong, so be careful not to get it undiluted on your skin or eyes, as it will burn. As a point of clarification I do biofeedback scans on a single generator, usually on remote mode but sometimes with tens pads, then I run the final optimized scan on the Spooky Central with plasma setting and all four inputs, pads, ultrasound, electromagnetic as well as plasma. I’d be happy to answer any questions as this is my full time job: getting well.